It hardly rains in Upper Mustang, the district of Nepal located beyond the Himalaya which juts out into the Tibetan Plateau. Rain is rare here, and floods even rarer. 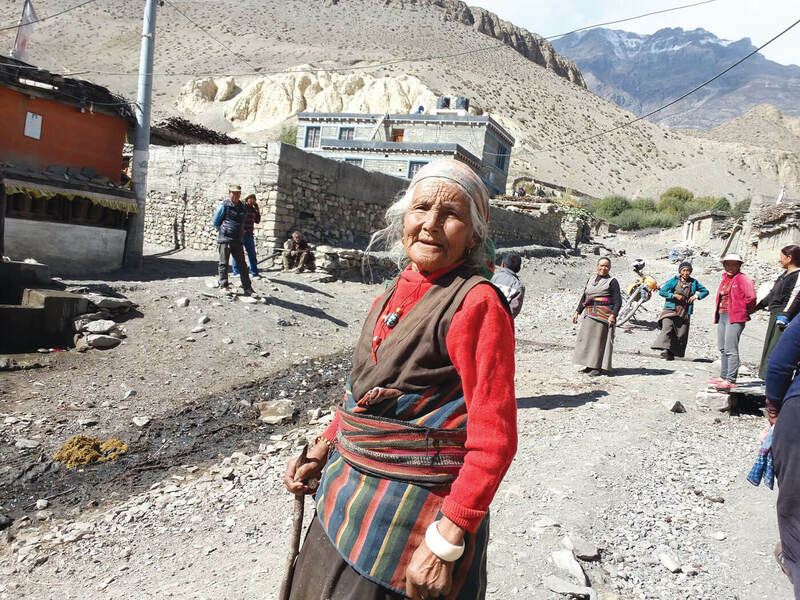 So when the stream next to her village of Tiri burst its banks five years ago, it was the first time 80-year-old Karma Gurung had ever seen a flood. The heavy rains and flood had killed a migrant worker from Lamjung, and few livestock. 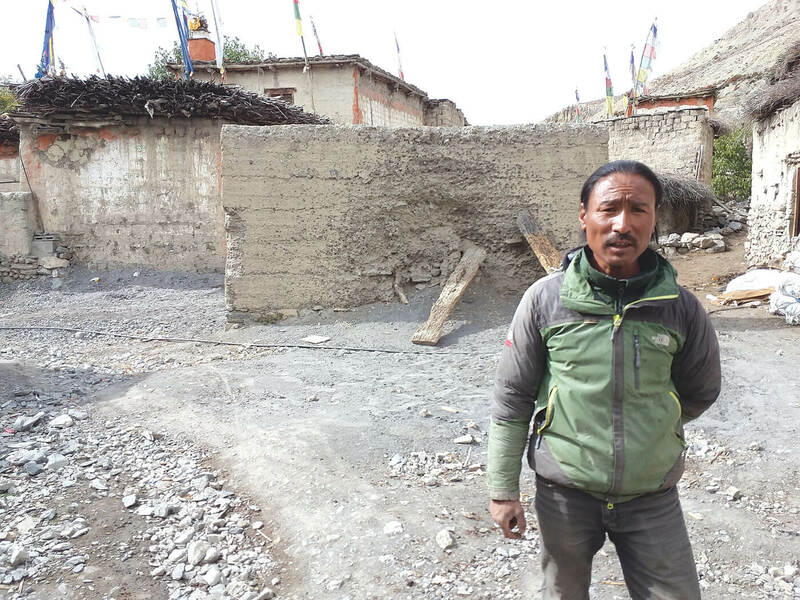 “It came suddenly, without warning and I lost 15 cows, ten goats and two horses,” recalls Norbu Gurung, pointing to how high the muddy water and boulders had reached. Konju Gurung lost a chunk of his nearby apple farm, which used to earn him Rs100,000 a year. Today, there are only huge boulders and sand where there used to be fruit trees. Flash floods, which used to be rare in this part of the Himalayan rain shadow, are becoming more frequent as weather patterns become more erratic. 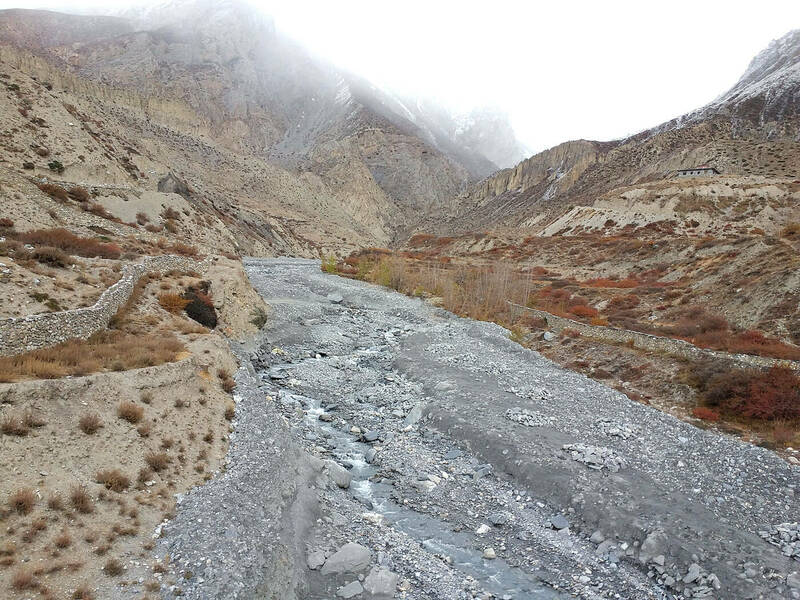 In the past decade, the people of Mustang suffered winter droughts, unseasonal snowfalls and cloudbursts. The geology of the area is made up of pre-historic deposits of sand and boulders, and with no trees to hold the topsoil together, these are easily dislodged by heavy rains. It was 1 Jun 2015 when it started raining heavily in Marpha village along the Kali Gandaki. 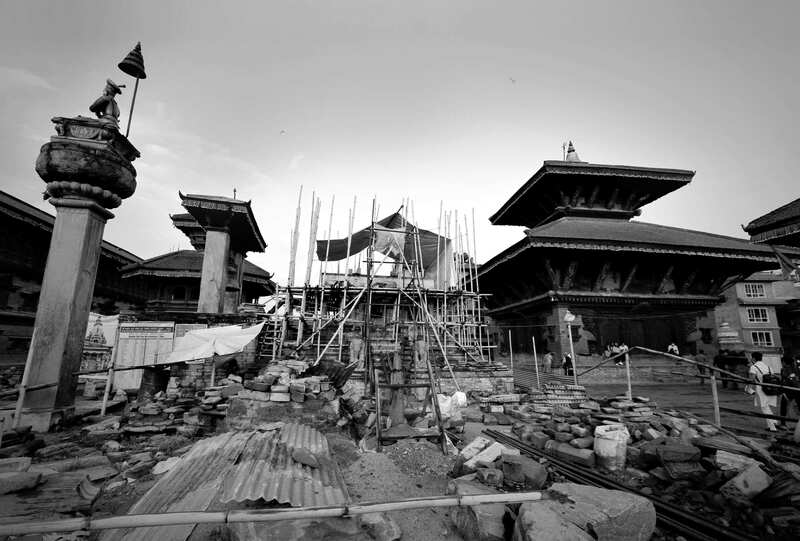 The monsoon rains were not due for another three weeks, but the freak storm dumped a huge amount of rain in the surrounding mountains, sending a wall of liquefied mud down a tributary of the Kali Gandaki. “It had been raining heavily, and all of a sudden there was this thunderous noise as rocks the size of houses were washed down in a sea of mud,” recalls Bhakti Hirachan, 77. The flood damaged 25 houses in Marpha and the scar of the flood can still be seen from the village. 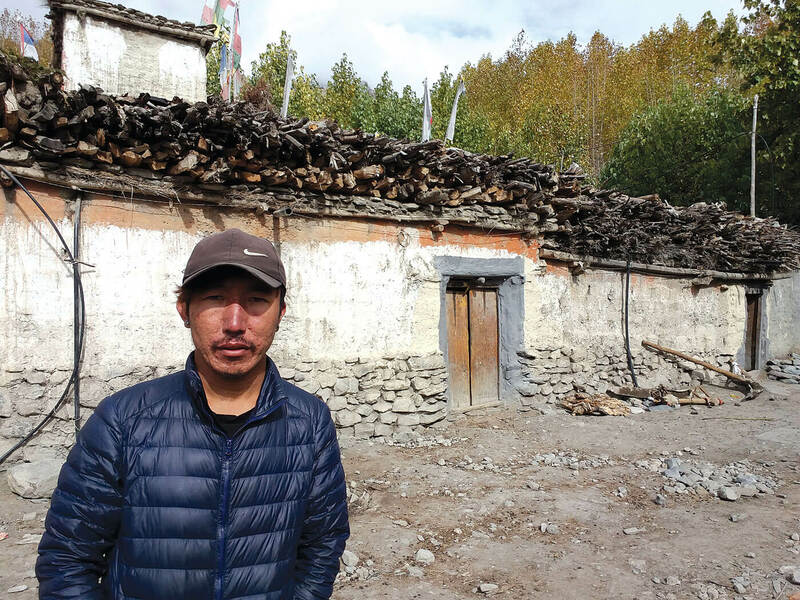 A few months later in August, floods came again and destroyed houses and fields in Jong village. Indeed, floods have become commonplace in what used to be arid Mustang. Villagers here say the weather has ‘gone mad’ in the past 20 years, and blame the wrath of the gods. Few here have heard of global warming and how scientists now believe it has made extreme rainfall and extended periods of droughts more common. Besides flash floods, the uncertain weather is also affecting local crops like buckwheat, barley and corn. Farmer Chiring Pemba Gurung of Jong village says his harvests have gone down by half in the last two years. “Winter snow is good for the spring crop, but for the past two years we hardly had any winter snow, and when it does snow it comes in the spring planting season,” says Chiring Pemba. Ironically, while the weather is creating havoc, long-term change in the climate has allowed vegetables and fruits to grow where they previously could not. 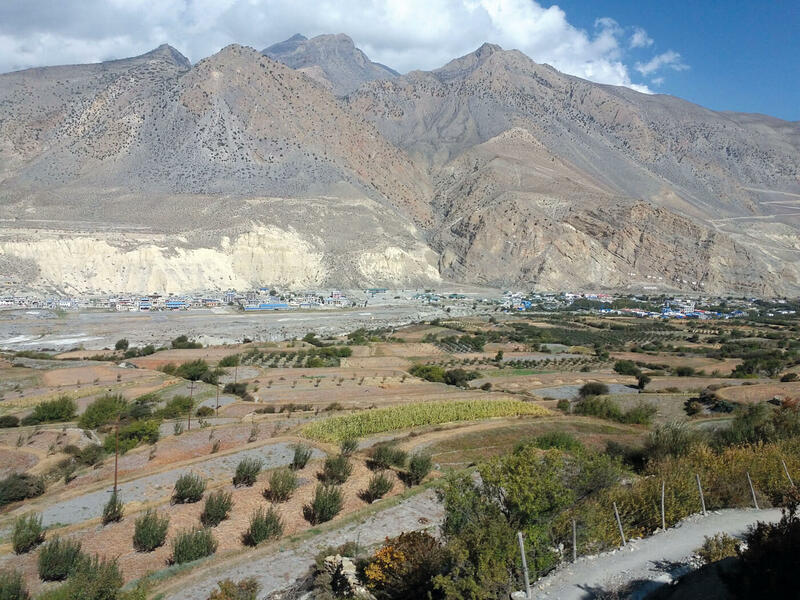 There are now apple farms in Upper Mustang, and farmers are switching to cabbage and cauliflowers, which used to be unheard of. 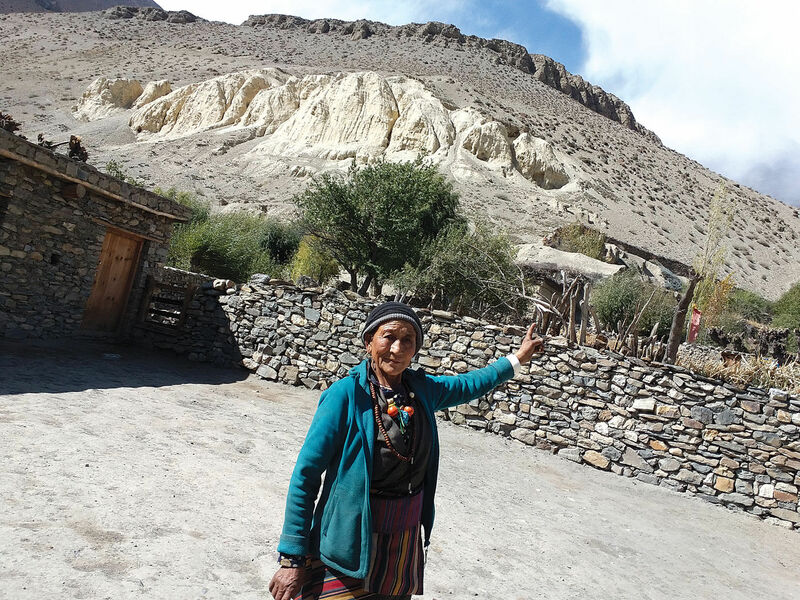 “There never used to be apple up there, now you can have orchards in Jharkot, Khinga, Dhe and other areas of Upper Mustang,” says Balkrishna Adhikari who is helping farmers here through the Apple Farm Centre. Meanwhile in the famous apple growing areas of Marpha and Tatopani to the south, new diseases like red spider mite, woolly aphids, and white grub have destroyed many orchards. 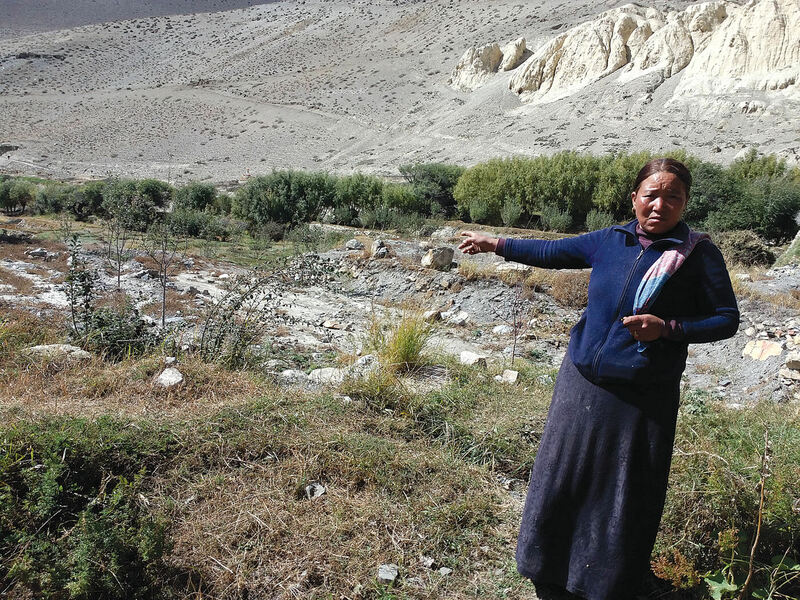 “It is getting too hot for apple trees in Marpha, and the regions of upper Mustang are becoming more suitable because of climate change,” Adhikari explains. Chiring Pemba Gurung planted 180 apple trees in his new orchard in Jong village, where apples never used to grow. He is confident that the new investment will increase his farm earnings in five years time. Climate change is a mixed blessing here in Mustang. 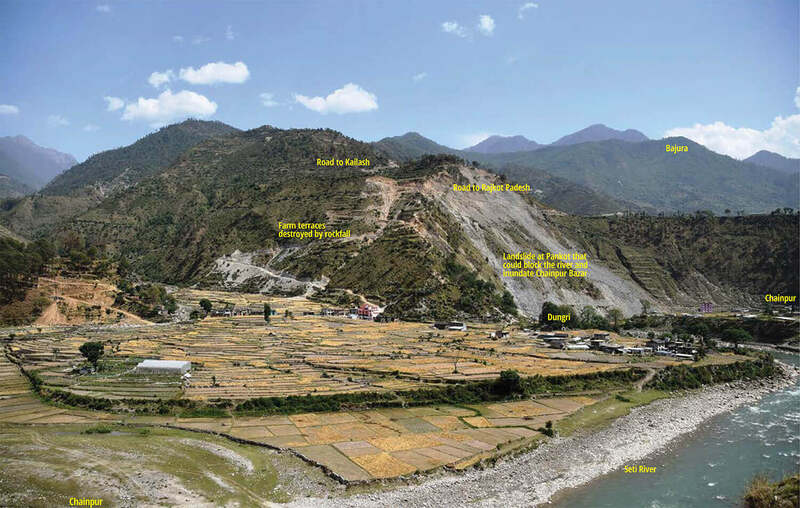 While it has unleashed floods and disasters, the warming trend has also allowed orchards and farms to move up to what used to be barren mountains. Global warming is melting the Himalaya twice as fast as the rest of the planet, and the most vivid proof of this are rapidly shrinking glaciers and the receding snowline. 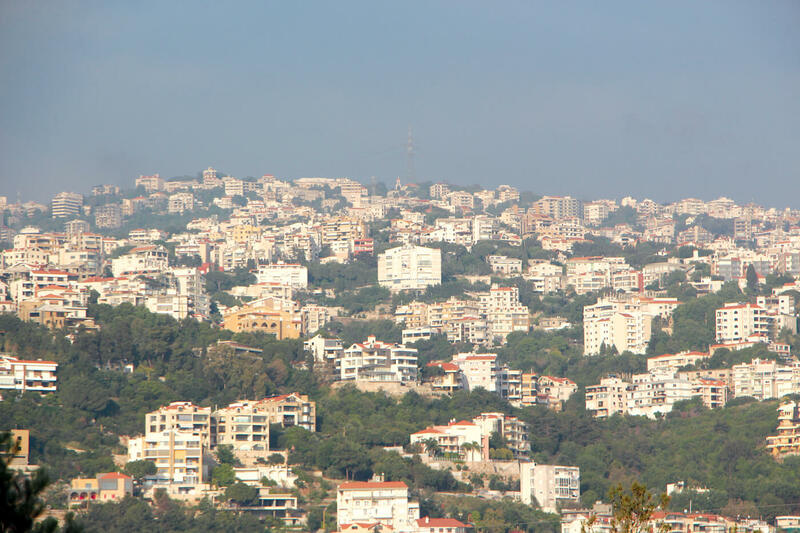 However, there is another less evident trend, and that is the movement of native plant species up the mountains to escape the heat. Recent research in the Indian and Nepal Himalaya examined plants growing from 60m above sea level up to 6,000m, which showed an upward migration of plants as global warming increased average temperatures across the mountains. Sub-tropical weeds and ferns growing in the low valleys of Sikkim and Kashmir are now found in higher elevations. The journal Nature recently reported that the flowering and fruiting cycles of pear and apple trees have changed over the last 50 years as have their size, colour and taste. Pine species in India’s Himachal Pradesh have moved 1,000m up the slopes in the last three decades, the magazine said. Even moss and lichen are said to be found higher up the mountains as snow cover recedes. Many of the species which cannot adapt by moving higher could eventually become extinct. There is also an upper limit to how far plants can move since there is no topsoil at extreme altitudes to support plant life.